This Mask Monday I am reviewing an interesting mask with an unique ingredient! 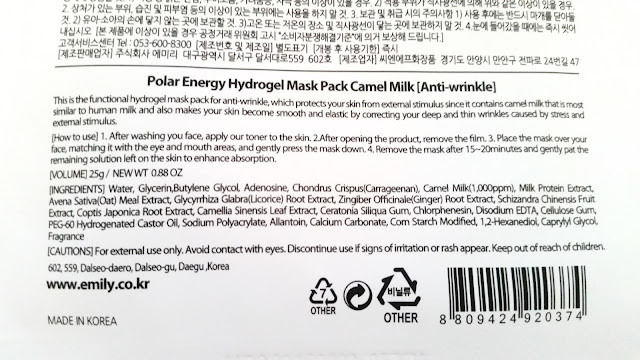 This mask comes with Camel Milk! Yup, you read right. Camel Milk! Believe it or not, Camel Milk is actually a popular ingredient for skincare products in South Korea. I've heard about it but this was actually my first skincare product with Camel Milk in it, so I was very excited. Botanic Farm is also a new brand for me and I've only tried a few of their products recently from the Botanic Farm box I purchased from Memebox. Anyways, let's get to know the mask! 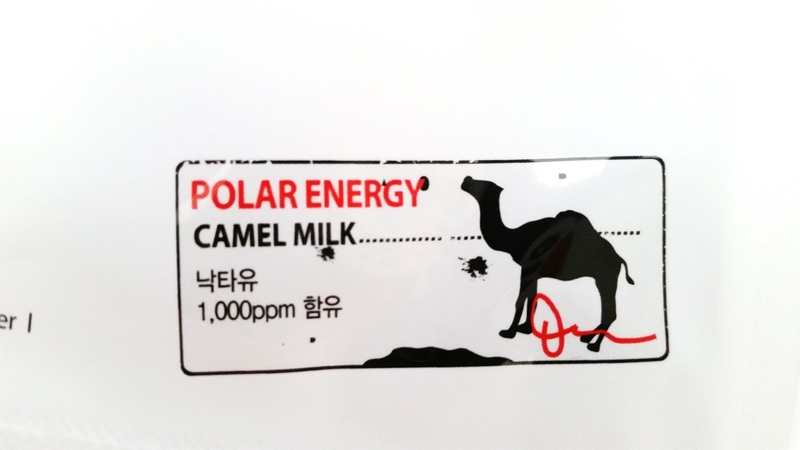 Product Description: Camel milk is a popular ingredient in South Korea. It's known to lock in moisture on the skin and protect it from external pollutants. The Botanic Farm Polar Energy Hydrogel Mask will not only moisturize the skin but also help with smoothing out wrinkles and fine lines. 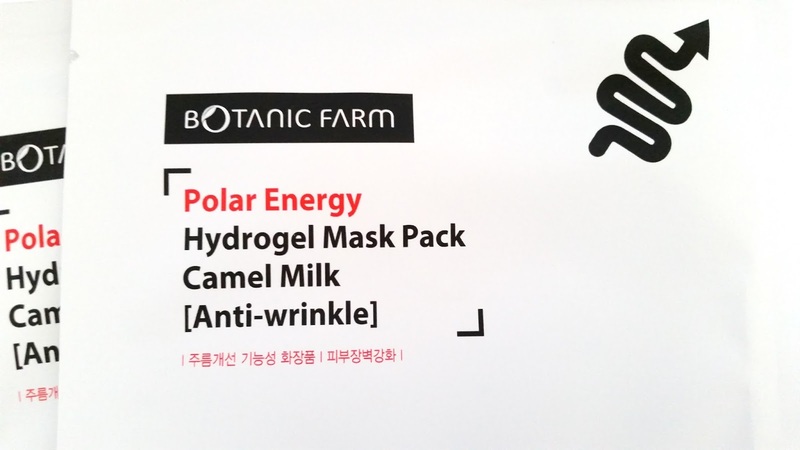 It contains 1000 ppm of Camel Milk extract which is rich in anti-aging ingredients. The mask will help firm the skin and add suppleness to prevent the skin from developing future wrinkles and fine lines. 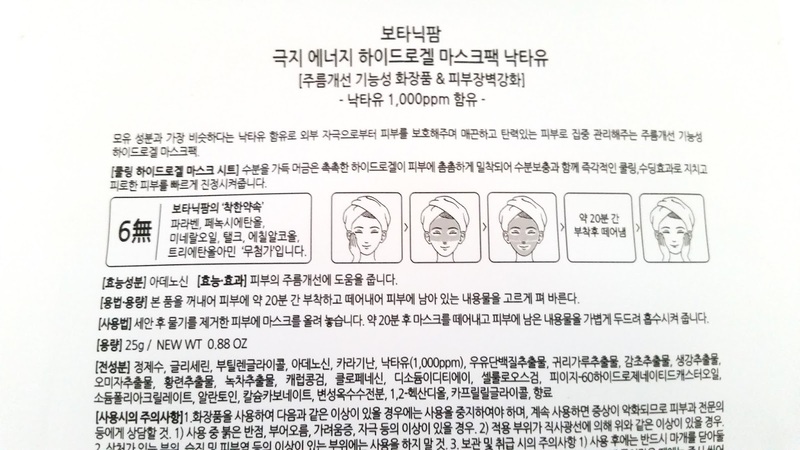 The mask can also help to balance the skin's moisture levels to keep it looking healthy and radiant. To Use: Wash and tone the face first. Carefully remove the hydrogel mask from its plastic wrappings. Gently place the mask on to the face and leave it for 20 to 40 minutes. 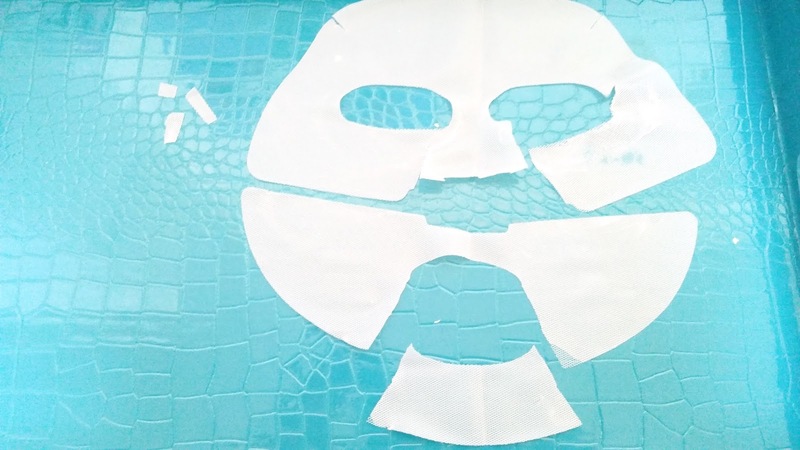 Remove the mask and follow up with the rest of your skincare routine. Ingredients: Water, Glycerin, Butylene Glycol, Adenosine, Chondrus Crispus (Carrageenan), Camel Milk (1000 ppm), Milk Protein Extract, Avena Sativa (Oat) Meal Extract, Glycyrrhiza Glabra (Licorice) Root Extract, Zingiber Officinale (Ginger) Root Extract, Schizandra Chinensis Fruit Extract, Coptis Japonica Root Extract, Cameilla Sinensis Leaf Extract, Ceratonia Siliqua Gum, Chlorphenesin, Disodium EDTA, Cellulose Gum, PEG-60 Hydrogenated Caster Oil, Sodium Polyacrylate, Allantoin, Calcium Carbonate, Corn Starch Modified, 1,2-Hexanediol, Caprylyl Glycol, Fragrance. 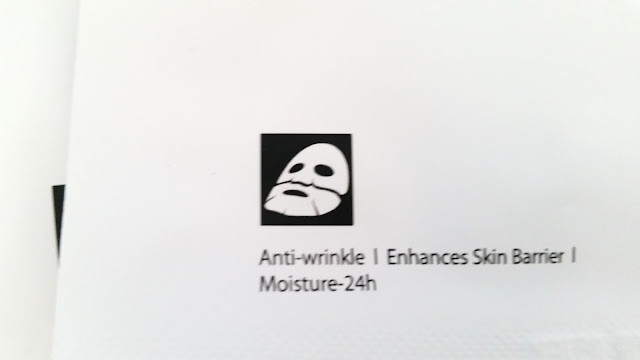 Packaging: This mask has a simple and to the point packaging. The only thing I didn't understand is the squiggly arrow on the top right corner of the mask. I'm going to assume that it has something to do with the mask being called 'polar energy' but I'm not sure how that part fits in either. I did like that the mask came with English ingredient list and directions! Let's hope all the products do that in the future. 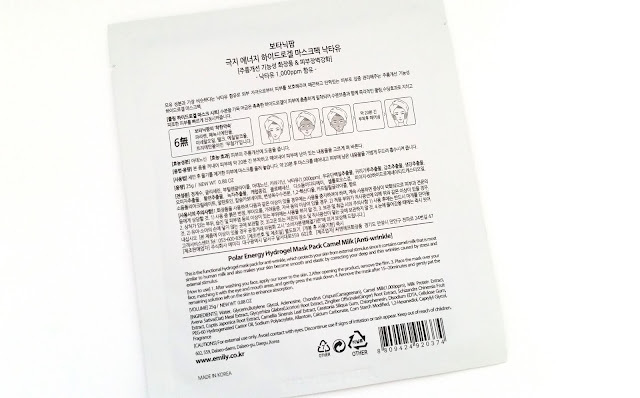 Texture: This is a hydrogel mask, so it feels different from sheet masks. It uses a mesh base and you can sort of feel the mesh when you first take the mask out of the pouch. The mask feels cool and a bit sticky. The hydrogel is on the thin side but not too thin. It is a bit stiff though and takes a bit of work (and scissors) to make it fit well. 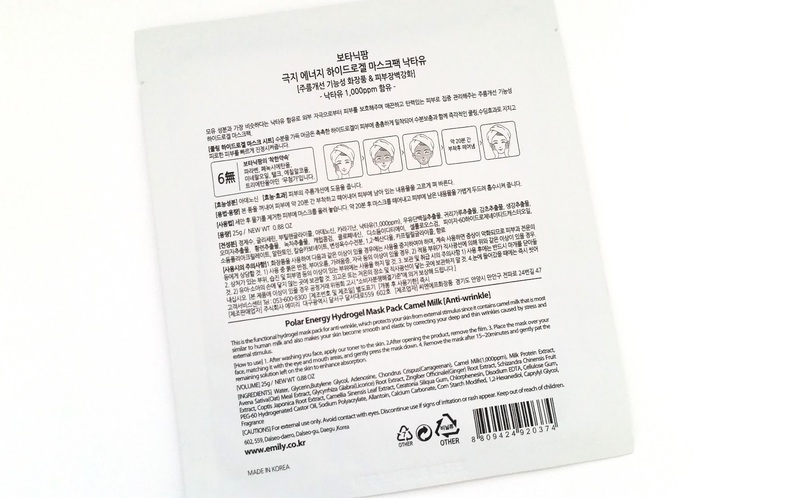 Color: The hydrogel mask is white in color. A bit opaque and you can see the mesh it sits on that helps it keep its form. Scent: Interesting would be a good word to describe the scent of this mask. The mask has fragrance and it smells a bit floral like at first. However, after a while it begins to smell like almond milk to me. The scent isn't strong and when the mask is on the face, the scent is super light for me. 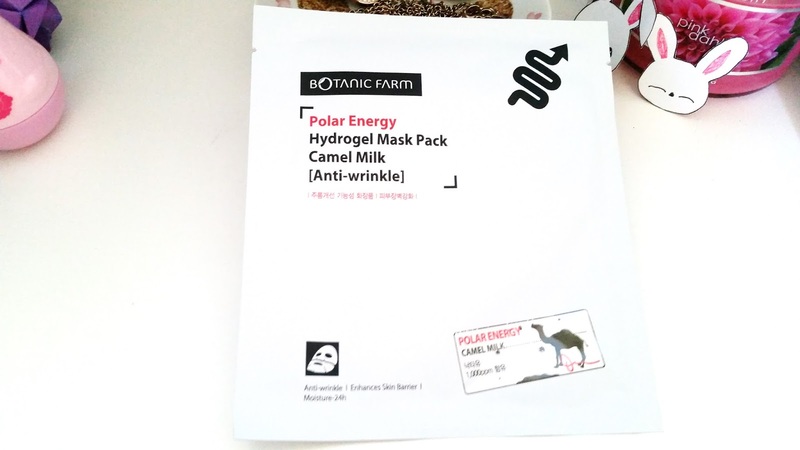 My Thoughts: I was super excited to try this mask because this was the first camel milk product I tried. It's (almost) always exciting to try new ingredients. I wasn't sure what I was expecting but I did expect it to be hydrating, since that is what it's known for. As always, I started with patch testing and once I determined that the mask didn't irritate my skin, I try it on full force. I thought I'd start with the negative first since it is short and get on to all the things I like about this mask after. So, what's bad about this mask? Well, for me, it's the fit. I know masks comes in a 1 size fits all type of deal, so not every mask is going to fit really well for me. However, this mask is just ugh. I had to pull of my trusty facial mask scissors and give it a few cuts. Even then, it still didn't fit well. The biggest issue is that it's a bit stiff. The folds of the masks are really set in making it hard to mold to the face. For me, the eye hole areas are bigger than I'd like and the cut of the mask is off. If I align the mask good-ish for the eyes area, I'd have a big section sticking out above my forehead. If I align the mask good for the forehead area, the eyes area become well, off. So, essentially, the fit is horrible. However, I am still using this mask because there are enough things I like about it that I'd deal with the awkward fit. So, what's good about this mask? Well, for one, it is very moisturizing. 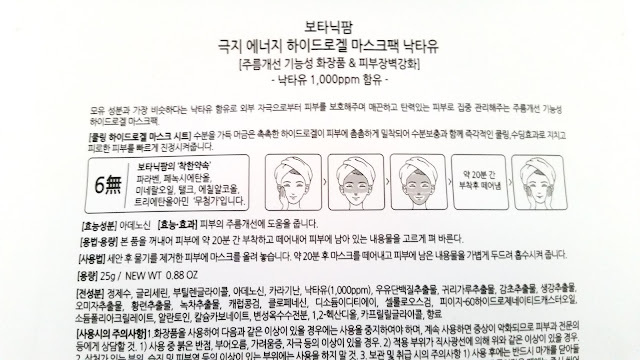 The mask doesn't come with too much excess essence but once the mask is applied to the face, it feels moisturizing. It's got a nice cooling effect due to its hydrogel nature and it feels relaxing on my face. After I use the mask, it leaves my face feeling firm and supple. It also brightens the skin a bit and provides a healthy glow as well. While I don't have wrinkles, I do have a bit of fine lines. Since this mask promises to smooth out fine lines and wrinkles, I was excited to see how well it works. After the first mask, my fine lines were still visible, a little lessened but not by much. However, after using a couple of these masks in the span of one week (I use a mask every other day), I did notice that my fine lines diminished a bit. Still a bit visible, but not as bad as before. Although, I would say that my fine lines aren't that bad to begin with. 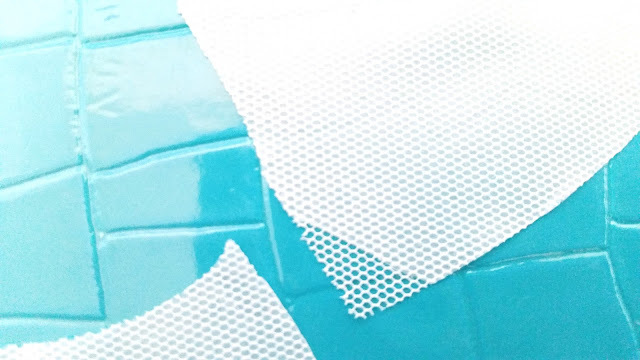 The hydrogel mask comes in 2 pieces, a top part and a bottom part. Since the fit was awkward on me, I took a pair of scissors and made adjustments. Here you can see that I detached the chin area, cut the slits around the nose area and had cut off some small bits on the nose section as well. Final Thoughts: Despite the fairly awkward and hard to fix fit, I still really like this mask. My face is smooth and supple after each use. It looks brightened and feels moisturized. The hydrogel mask also helps to minimize my fine lines a bit, which is awesome! 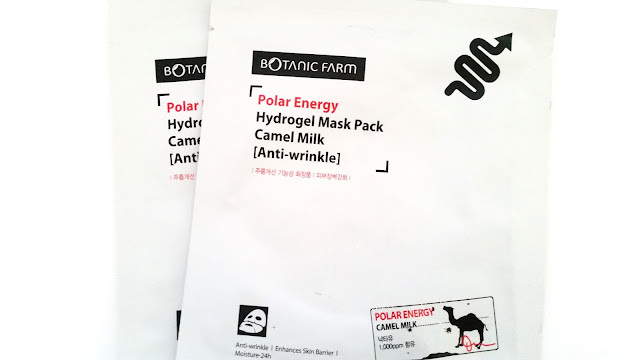 Would I repurchase this Botanic Farm Polar Energy Hydrogel Mask Pack in Camel Milk? Maybe. As much as I love this mask, I do want to try and discover other masks. Especially ones with better fit and still provides all the functions that I want. 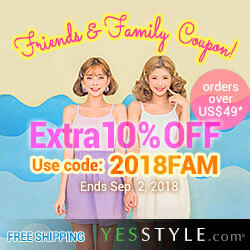 Do I recommend this mask? Yup! The fit might be awkward on my face but it could be different on yours. I think this masks have enough amazing benefits to try at least once. If you are looking for a moisturizing mask that brights, or a mask to minimize fine line and wrinkles or a mask to firm up the skin and add suppleness, then definitely give this Camel Milk mask a try! 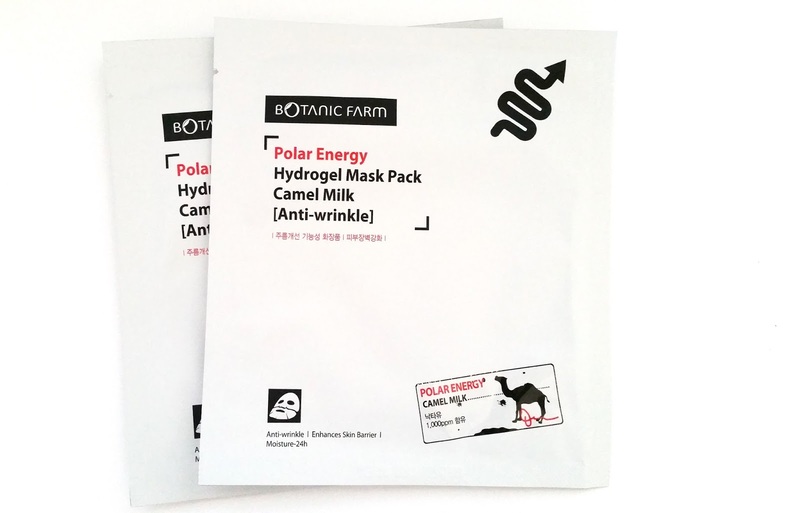 Have you tried any of Botanic Farm's hydrogel masks yet? What are your thoughts on them? Leave a comment below and let us know!